The Russian Embassy in the UK stated that the policy of the UK Government towards Moscow “is a very dangerous game”, as World War 3 fears mounted. The Embassy continued to lambast the UK for its “unfounded accusations” and labelled events as a “source of concern”. 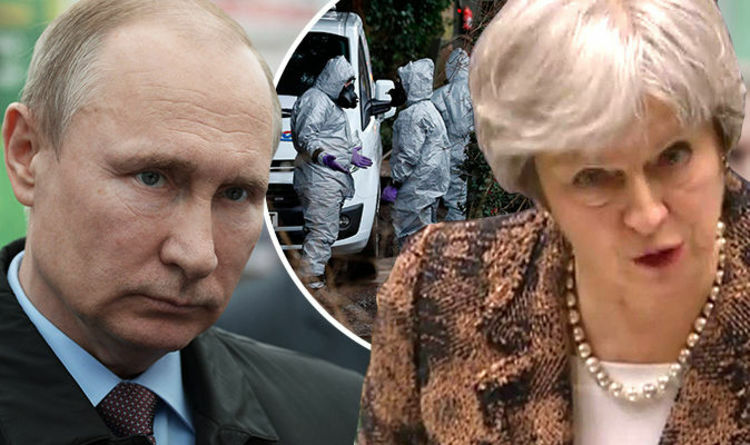 It went on: “Literally the next day after the first reports on the poisoning of Mr Skripal and his daughter the Embassy officially requested the Foreign Office to provide information on their health situation and the investigation. “This is important to us since his issue has become quite a negative factor for the relations between our countries due to the unfounded accusations against Russia advanced by the media. “British officials don’t provide any additional information and don’t distance themselves from the media campaign. The investigation is being concluded in a non-transparent manner, whenever for the Russian side nor for the public. The Russian establishment explained that Russian journalists based in the UK have been receiving threats following the incident and stated that Britain has not provided any “detailed information” regarding the health of Mr Skripal and his daughter. It continued: “The Foreign Office has informed us that the UK considers Mr Skripal as a British citizen. "Still, the British side has provided no detailed information regarding their health, thus confirming that nobody, including the British media, has obtained access to investigation files since March 4 when the incident occurred. “We would like to stress once again that we are outraged by the anti-Russian media campaign, condoned by the Government, that influences the investigation and has a psychological effect on British residents. The seemingly aggressive rhetoric from Russia comes after a demonstration of Moscow’s devastating weaponry from Mr Putin at the start of the month that could add to World War 3 fears. The Russian leader announced his “invincible” cruise middle and horrifying nuclear torpedo. Mr Putin issued a stark warning to the world by boasting about Russia’s military might. He stated: "Russia still has the greatest nuclear potential in the world, but nobody listened to us. Listen now." The 65-year-old’s aggressive rhetoric continued as he stated that his new line of arms could make NATO defences “completely useless”. In a sign of solidarity with the UK, the American Secretary of State, Rex Tillerson, recently detailed that the US stood in “solidarity” with Britain and “will continue to coordinate closely our responses” in wake of the Russian spy probe.